The Mazzer Mini is a machine that is practically unmatched and unbeaten when it comes to coffee grinders. It has a new design, state-of-the-art features, and the ability to transform your coffee beans into the kind of textured flavor you have been looking for. It will efficiently extract coffee soluble for you. You will get what you want and need from the coffee beans without any other added chemicals and processes. It will also retain the oxygen in the beans and ensure the flavors are locked in. this gives the best taste when it comes to coffee. Well, for these, and plenty of other reasons, you need to seriously consider buying a coffee grinder, and especially if you are a coffee geek or coffee enthusiast. The benefits are way more than you would expect and the experience is phenomenal. 4.1 How fast does this grinder work? 4.2 Does it come with a dozer? 4.3 What volts and watts does it use? And is it certified in the US? 4.4 How do I use it? Based on the name alone, you already have an idea of what the manufacturer was looking for. He wanted a coffee grinder that is complete with all the capabilities, materials and qualities that a normal sized grinder has, but in a smaller package. Yes, this is not regular size. It is much smaller. With the decrease in size, also comes the decrease in cost. So, you get to have the same qualities as a grinder, and the same capabilities but, in a much pocket-friendly cost. Anyone can now afford to have a grinder in their homes. 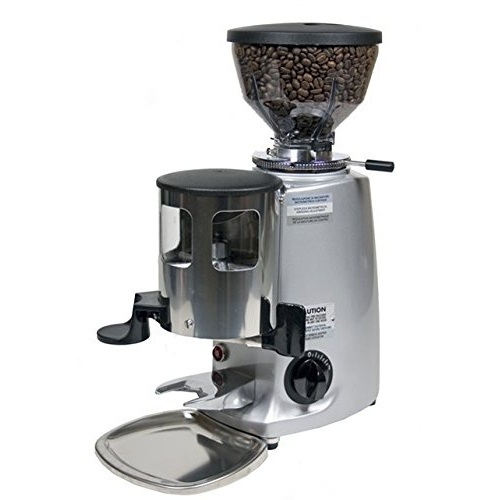 Commercial coffee grinder; the first thing you need to know is that this is a high-end coffee grinder that is synonymous with most coffee shops and restaurants. In the world of coffee, Mazzer is the name that is world-renowned to be associated with espressos(explore other espresso coffee grinders). So, if your local coffee joint makes espressos, you can be sure they are using the Mazzer Mini Espresso Grinder. It is very easy to use, in fact, there are no steps you need to memorize in order to use it effectively. You can easily adjust the grind the way you like it, to even the smallest degrees, in order to give you the most control in your grinding. Steel burrs; it comes with 58 mm of flat Swedish steel burrs, that are made from high quality materials, which are built to last. Because of their size, the burrs grind larger quantities of coffee at once and at a very high speed. The coffee beans also remain cool for a long time. Size; the machine comes with favorable dimensions that are not too big. This will fit perfectly in your kitchen counter. It saves you storage space, and you can be able to remove the hopper even while the coffee is being ground. The grind; the most important aspect of any grinder is the grind. Mazzer is a company that is known to produce nothing but perfect grinds. You can be able to also control the grind of your beans so as to get only the best out of the grinder. It is easy to use: You won’t need to keep reading and re-reading the manual to master the Mazzer Mini. It is straightforward and easy to use. You only need to insert your beans, press a button and voila! The coffee starts to grind. The steel burrs; the burrs are made of steel, and they are of high quality, meaning that they will serve you for a very long period of time. The size; with its compact size, this is a machine that can fit into any kitchen space, be it big or small. It does not need any additional spaces for its storage, which saves you time and effort, plus money as well. Easy to clean; it is an easy to clean machine as most of the parts are detachable. Once you detach you can clean them in the dishwasher. Size: As much as this is an advantage, it is also a disadvantage if you are looking for a coffee maker that can make several cups of coffee at once. How fast does this grinder work? The grinder and will grind the beans for your espresso in under 10 seconds, making it extremely convenient when you are in a hurry. Does it come with a dozer? Yes, the Mazzer Mini Espresso Grinder does come with a dozer. What volts and watts does it use? And is it certified in the US? It uses 250 Watts and 110 volts. It is certified both in the US and Canada as well, which means that you can use it in both countries without needing to convert in any way. It is very easy to use, in fact, there are no steps you need to memorize in order to use it effectively. You can easily adjust the grind the way you like it, even to the smallest degree, in order to give you the most control in your grinding. There’s nothing better than a great cup of coffee. It wakes you up and makes you alert. A bad cup of coffee, on the other hand, is tasteless, has no effect on your body and is not even worth drinking.